I’m making new Google Sites. Are you? Once Google released it’s testing version of Google Sites this summer, I immediately switched over and haven’t returned. In fact, I redid my Fennovation site to the new Google Sites. Does it do everything I want it to, yet? No? Is it better in almost every other way, though? Yes. So far, I have helped our entire staff make consistent splash pages (there is not a domain template option yet, but since the standard Site looks the same, it’s not hard to standardize them). I have also taught my English class to make them for three different digital writing (collaborative) projects. What are you using the new Sites for? Thanks to my co-worker, Brian Gray, we have the new Google Sites on our school domain. Over the past five months, I’ve had the opportunity to test it out and rebuild some of my old sites in the new version. Now, that version is live and ready to hit all school and work domains by November 21. With that unveiling, I’ve started to transition fennovation.org to the New Google Sites. While it’s still a work in progress, I’m excited for the new, sleek look! I’ve also created a handy Google Sites presentation and a Google Sites handout for making public splash pages. While the new version still lacks some necessary features like being able to hide pages from the navigation bar (but still have them visible), remove header slots, control width of site, and control some of the font colors (limited options), the simplistic design is ideal for teachers. In fact, I would not want too many options. The more options, the more room for “ugly” Sites and…who wants that? Finally, I resized the table to fit my Site. And, that’s it! When you are ready to go, just press “Publish.” FYI – if you go back and edit your Site, you will need to press “Publish” for your changes to be live. With the announcement today that the New Google Sites will be launching publicly next week, it’s time to take the plunge into the new Google Sites. Over the past five months, I’ve tested it out by building over ten Sites for a variety of purposes. Though the new Google Sites needs very little hand-holding, I made an updated presentation to outline the features and make it even that much simpler! Thanks to my co-worker, Brian Gray, we have the new Google Sites on our school domain. Over the past month, I’ve had the opportunity to test it out and rebuild some of my old sites in the new version. It’s better late than never to start work on your online presence. Google Sites, though not perfect, are a tool of choice because of their integration within other Google Apps. That said, they can be use for far more than a teacher Website. Use them for digital portfolios, newsletters, events, directories, and much more! And, if you’re using them for teacher Websites, why not structure your courses on your site so that they look like touchscreen apps? Many times, I see courses in a traditional drop-down list with a lot of text. While this was common in the early 2000s, most students use a touchscreen device when accessing online content. And…that is not the most effective way of reaching that audience. I’ve started making my site full of pictorial boxes so they are not only easier to see, but easier to access. Make your page with all of your courses look similar to Google Classroom. You can make these boxes in Google Drawings and then, just hyperlink each box (see my image map tutorial below) to the correct page. 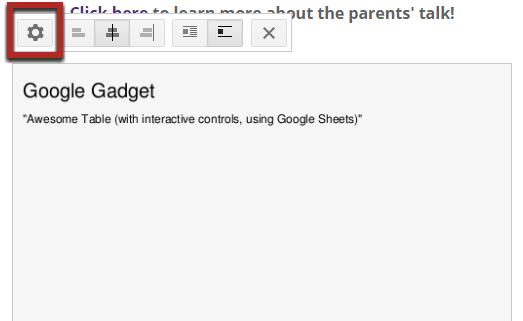 OR…you can take a screenshot of your Google Classroom and insert it in Google Drawings. Then, just draw invisible boxes (see my image map tutorial below) over the squares and hyperlink them to the correct pages. This will make your courses page more visually pleasing while also being more accessible. Check out my beginner and advanced Google Sites tutorials for more ideas. Thinking of doing portfolios next year with your students? Why not start now?! Check out fennovation.org for more Googleness! Last week, I presented at #tcea16 about revisions and hacks I have done to Google Sites to make them, well, respectable. So, until Google Sites gets the makeover it’s long since needed, check out these steps to give your Site the facelift it needs. No more ducking from others when your Website is mentioned. Stand proud about that Site now! Check out my Set Your Sights on Sites: Advanced and check out fennovation.org for all of my resources, including beginner tutorials, on Google Sites. Enjoy! Let’s make some beautiful Sites! Getting fancy with Google Sites – your holiday treat! Just what everyone wants to do over a break – edit Google Sites. But, did you know that the notoriously clunky Google Sites can also be snazzy? Need some inspiration? Check out this one! Pretty snazzy, right? And, the good news is that you can create clean and efficient Google Sites without being a Web designer or Web developer. Check out Set your sights on Sites (beginner) and Set your sights on Sites (advanced) for step-by-step instructions on how to snazzify your Google Sites. Today’s update includes how to create a custom message on your Google Site when viewers visit it. Check out more Googlicious tips and tricks on fennovation.org. Wishful thinking, right? Well, while we wait for Google Sites to get a makeover, I gave my own Google Sites – Volume 1 presentation a makeover. Check on fennovation.org for the advanced edition as well as other Sites resources. Can Google Sites become beautiful? Why, yes, they can! After finding a tutorial on how to use OverDRIVE.io to turn a Google Doc into a Website (courtesy of the Google Gooru), I decided I had to try it. And, though, it is only a free trial, but available for Apps Domains through the Marketplace, its simplicity has a huge benefit! You can always adjust the page settings of a Google Doc or publish to the Web if you would like the Website appearance and don’t want to use a third party program. Check out fennovation.org for updates to Google Sites 1 and Google Sites 2 presentations! Enjoy!